Brad Leithauser is an American poet, born February 27, 1953, who graduated Harvard College and Harvard Law School, and worked as a research fellow at the Kyoto Comparative Law Center in Japan. He also lived abroad in England, Italy, France, and Iceland. This collection is an amalgam of new poems and sections of poems from several previous collections spanning almost 30 years, including Hundreds of Fireflies (1982), Cats of the Temple (1986), The Mail from Anywhere (1990), The Odd Last Thing She Did (1998), and Curves and Angles (2006). In compiling this New and Selected Poems, Mr. Leithauser borrows liberally from the aforementioned volumes. One noteworthy omission is the absence of the title poem of Hundreds of Fireflies, a poem with its particular and enduring childhood charm. Overall, the collection is well conceived and implemented, the pieces falling into place in such a way as to provide insight into the development of Mr. Leithauser as poet, capturing excellent examples of his poetic creativity and adventuresome nature, especially important to those not fully familiar with his writings and the many channelings of his creative mind. His poetry spans the surfaces, mines the depths, and embodies the expansiveness needed for the unique and distinctive poetry he writes. With a full panoply of poetry techniques, he is able to take standard prosody to the limit and sometimes beyond. Broken words are sometimes employed to do the work. His single-word-per-line sonnet comes as a pleasant surprise. Some of the poems are long and wind down more than one path, capturing unique weaves of history and retrospective. Such poems require careful attention. Over time, in order to mine his works, you learn to be a faithful follower, to enjoy the rewards, even those beyond the surface. In this multifarious collection, be prepared for unusual locations, landscapes and even seascapes, for in-depth explorations of nature and of the human heart―in short be prepared for experiencing a unique poetic sensibility. For other examples of poetic techniques at play, consider the following: Mr. Leithauser includes the poem “11 Astronomical Riddles” from the Hundreds of Fireflies collection―the sun, Mercury, Venus, Mars, the remaining planets and even an asteroid—the states of each brought forth through the technique of personification. Or consider the web of imagery in the poem, “In a Japanese Moss Garden,” (from the Cats of the Temple collection)—its extensive and varied imagery seemingly in flux, yet morphing to form a final portrait, dramatizing the role played by effective closure. Even those familiar with individual collections of Mr. Leithauser’s poetic works will find surprising correlations across the range of these collections, in the biographical, the human states and in the carefully portrayed forays into so many aspects and dimensions of nature. With incisiveness, Mr. Leithauser reaches into the drama of lives with a sensibility that makes great poetry live and endure. The reader is allowed, time and time again, to share the emotions of being there as the dramas unfold and resolve. 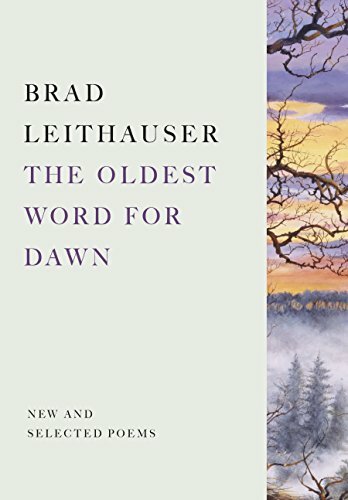 Mr. Leithauser, of course, is a widely celebrated novelist and a master of the narrative, talents well represented in the poetic evocations in this volume, poems that range across continents, periods of lives and myriad differing contexts. He reports that the title of this collection emerged from a contact he had with a philologist who uttered something in the Sumerian language. Mr. Leithauser even requested that it be repeated―turned out to be what Mr. Leithauser concluded was the earliest word for dawn, which in many ways is a metaphor for the exuberant work found in this comprehensive poetry volume―such a range of work in which Mr. Leithauser utilizes a wide variety of poetic prosody and other devices, from line structures to the splitting of individual words to propel the reader’s imagination and to secure his or her engagement. From beginning to end, this is a complex and challenging journey, created through careful design to inveigle, involve and capture imaginations. Selections from each independent section bring with them new perspectives. Collectively, The Oldest Word for Dawn brings, in essence, Mr. Leithauser, the complete poet. Laverne Frith, founder and co-editor of Ekphrasis: A Poetry Journal, has four full-length poetry collections, the most recent being Estuaries of the Mind (AuthorsPress, 2018). Featured twice on Verse Daily and widely published in literary journals, his poetry chapbooks include four from Finishing Line Press and one from Rattlesnake Press.